A majority of Supreme Court justices cast doubt Wednesday on drunken-driving laws in 13 states that make it a crime for drivers to refuse breath or blood tests sought by police without a warrant. While many justices acknowledged the laws' good intentions — to crack down on drunken driving, particularly in rural states such as Minnesota and North Dakota that are plagued with the problem — they wondered why police can't get warrants first. "You're asking for an extraordinary exception here," Justice Anthony Kennedy told lawyers representing the two states and the federal government. "You're asking for us to make it a crime to exercise what many people think of as a constitutional right." Even so, several justices indicated they might be willing to allow the criminal sanction for refusing Breathalyzer tests without warrants, since the intrusion is minimal. Blood or urine tests, they said, would require a warrant under the Fourth Amendment's ban on unreasonable searches and seizures. "What is wrong with a Breathalyzer test when it can save lots of lives and is given to those people where there is probable cause ... or at least reasonable suspicion to think they're drunk?" asked Justice Stephen Breyer. The three cases under review were filed by drivers in Minnesota and North Dakota who were charged with a crime after they refused to take "deep-lung" breath tests. Eleven other states have similar laws: Alaska, Florida, Hawaii, Indiana, Kansas, Louisiana, Nebraska, Rhode Island, Tennessee, Vermont and Virginia. Federal district and appeals court judges upheld the state laws, which the drivers then appealed to the Supreme Court. In general, the high court has ruled that police cannot search a driver or vehicle after an arrest without getting a warrant, unless it's for their own personal safety or to preserve evidence. In 2013, it ruled that police cannot conduct blood tests for drunken driving without a warrant. Based on that, the challengers in the Minnesota and North Dakota cases said, refusing such tests should not constitute a crime. During 70 minutes of debate Wednesday, most of the justices appeared conflicted about breath tests. On one hand, they said, blowing into a little box is only a minor invasion. On the other hand, why can't police get a warrant within minutes, even in rural areas with small police departments and a dearth of judges or magistrates? Justice Samuel Alito was the only justice who seemed to be solidly on the states' side. "The reason why people don't want to submit to a blood-alcohol test is that they don't want their blood alcohol measured," he said. "It's not that they object so much to blowing into a straw." Some of the court's liberal justices appeared to agree with that line of reasoning. Justice Elena Kagan noted that police have an interest in testing a driver's breath quickly, before his or her blood alcohol content goes down. "Blowing is a search, there's no question about that, but there are searches, and then again there are searches," Kagan said. "There are more invasive searches and less invasive searches." And deputy solicitor general Ian Gershengorn, representing the federal government, warned the justices that judges and magistrates are not available around the clock to issue warrants in more remote parts of the country. But Chief Justice John Roberts wondered why states deserved special considerations to combat drunken driving, when they cannot search a cellphone without a warrant to see if a driver had been texting. "It wouldn't surprise me if there are at least as many accidents caused by people texting while driving as drinking while driving," he said. By the end of the argument, it appeared a majority of justices were lining up against the states, though a compromise seemed possible. "Do we dispense with a very important requirement in our law, that before you search — particularly the inside of a person with a needle or in an intrusive way — that you get a warrant?" 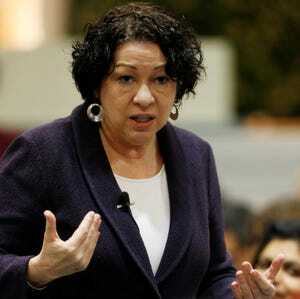 Justice Sonia Sotomayor said. In Ohio, you can be charged with an enhanced charge for failure to consent to a breathalyzer or other alcohol consentration tests. The Supreme Court's decision in this case very well may affect the legality of Ohio's current OVI law in this regard.